You must make reservations at least 5 minutes in advance of the time at Carmine's Rosemont. Came to Carmines for Easter Brunch and it was amazing! The restaurant is beautiful, we sat outside on the patio and it couldn't have been nicer! The staff were all fantastic and made everyone feel welcome and comfortable. The food was amazing, delicious selection of seafood, breakfast selections, carving stations and omelette bar! And the mimosas we fabulous also! Thank you, we will definitely be back to sample the everyday menu! Excellent food. Excellent service. Great experience. Great for groups. Food was delicious and the wait staff was very attentive. Excellent Service. Food was awesome. Pastas Fish appetizers outstanding. Our server was excellent. Manager came to table several times to ask if we needed anything. Pricey but huge portions and outstanding quality. From coming in the door to the dining experience it was perfect. Great food and excellent service. Wrong ambiance with such a classic Italian menu. According to our waitress, the owner "insisted" new hip hop and modern music be played. The food and service was excellent, just wish the music and ambiance matched the menu and food. Did not disappoint! The veal was amazing. Went for the food due to other recommendations. Food was great, our service was ok. Never was offered cheese tableside for the food or pepper grinder. Super loud. Servers were using fowl language and continued to be rude to eachother. We will be back! enough said....It has its own identity with the outside seating, a combination of elegant dining and a sense of a high end sports bar. The menu is tight with something for everyone. A good wine list and cocktail menu to compliment the food and all "taste buds" at a Rose Bud!!!! Great food and spirits. Even on a friday it was not loud or over crowded. Best experience I have had at a restaurant. Food was amazing. The service was second to none. My new favorite restaurant. Have nothing but fabulous things to say about Carmine’s. It was my first time there. The service was phenomenal and the food was great. Very nice ambiance too. Will definitely be back! Beautiful establishment. Great menu with nice selections if wine by the glass. Service and food were amazing. From the moment we walked into the restaurant, it was top notch service and attention. Not overbearing whatsoever. Prompt and courteous, the entire staff was great. The portions were large and flavorful. More importantly, you can taste the freshness and quality. Had a great time at Carmine's celebrating my birthday! The restaurant was beautiful, the food was all delicious and reminiscent of a home-cooked Italian meal. Service was also great, from our servers to our bussers to the FOH staff. We will be back! Had the special on the menu, linguine marre - I forget the exact dish. 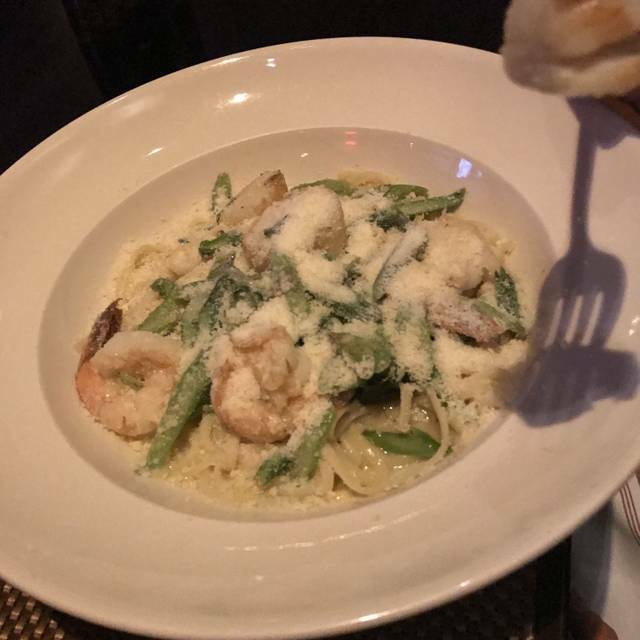 Linguine with 2 scallops and 2 jumbo shrimp with asparagus and roasted peppers tossed in garlic and oil. It was very tasty. I tried a friend’s brick chicken with the jalapeños and am likely to get that the next time around. Our husbands had the 16oz strip steak with oregano and the other had the menu special.... don’t quite remember what it had. The steak was tender, and held up the next day - still amazing! Everytime we go there, we enjoy this restaurant more than before. Excellent Host, managers & waitstaff. Food is very average and grossly overpriced. The food at Carmine's is always very good. We have dined at the Chicago location a few times and decided to try the Rosemont location before a concert at the Rosemont Theater. The food did not disappoint and the service was outstanding. Our waiter asked if we were going to the show and made sure our drinks and entrees arrived in plenty of time for us to enjoy them and still have plenty of time to get to the show. Gluten Free options too. One of our diners has gluten allergies. Our server made certain her entrée was prepared accordingly. We will be back! What a wonderful experience!! We were seated right away and greeted immediately by wait staff. Our waiter Ro, was very solicitous, helpful with menu suggestions, and overall outstanding. Pasta dishes were superb!! Crab Bisque soup was phenomenal. Would definitely recommend and can’t wait to go again. Waiter was very nice but seemed a little nervous. Food came out within a reasonable amount of time after ordering. Drinks were also mixed well. Only gripe is that the peppercorn on top of my steak was excessive. Had to take a lot of it off in order to enjoy the nice cut of meat beneath. Bar tender, Cindy, was very nice and made a perfect old fashion. Our waiter made the experience even better! He entertained my younger girls with magic tricks! Top notch service! Phil and the staff were great hosts. We were celebrating my daughter’s birthday and they went above and beyond my expectations. We had a lovely time at Carmine's, and the service was quite nice. Several people asked about our comfort level..which made us feel well attended. Don't ask me what the occasion for my reservation is if you aren't going to acknowledge it. Especially after I mention it again to my waiter. It was made even write watching 3 other tables have a candle lit and being dang Happy birthday to. Stopped in for a quick lunch on the way to the Airport. White fish special with vege’s was very nice, flavourful and firm. Super slow service for Monday evening when restaurant was barely half full , over 45 min to get burnt steak.., supposed to be medium. Total disappointment. Unfortunately Carmine’s is not up to same standards as the surrounding restaurants in Rosemont. My husband and I came for dinner before seeing a concert at Allstate arena - which the staff knew and our whole row was also going to the show. Of the couples that sat around us, our order was taken last and the table next to us in particular finished their food prior to us even receiving our meal. After being seated at 5:53, we received our food at 7:30, causing us to be extremely rushed in eating, paying and leaving as we were going to be late for the show. It definitely put a damper on the night. Girls Night Out with a concert! Place was packed so it was very loud. Food was wonderful. The service wasn’t so good. We had multiple people waiting on our table. My sister ordered the soup that was on special and after waiting a long time, she was told by our primary waiter that they had just ran out of the soup. Five minutes later, another staff member brought her a bowl of the soup. We were very confused. Food took a long time to come out even after we arrived early to give extra time. The food was very good. Everything is ala carte, so it’s very expensive. It was very noisy. Our server was friendly and helpful, but because it was so busy she couldn’t fulfill her promises to us. The sage butter cheese ravioli sauce had no sage flavor it was just a butter sauce. We told the wait and he had no regard for our concern. We ordered two cappuccinos and a cannoli, the cappuccinos came fast however we waited 20 minutes for the cannolis. Again, the waiter didn’t care. Our reservation was right when they opened, so it was not crowded at all. The food was amazing and the service was great. Can’t wait to visit here again!